So… you know that saying, “Never work with children or animals”? Um, yeah, we kind of ignored it. There were no lions or tigers or bears, oh no, but there most certainly were children and lots and lots of them! What are we talking about? Our baking workshop of course! 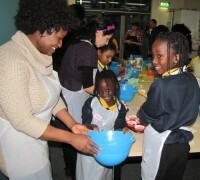 The Friday before the Friday before last, Morningside Children’s Centre – specifically, the lovely Marie – let us loose in one of their rooms to spill flour and break eggs set up a baking station that even the mighty Delia would be proud of. 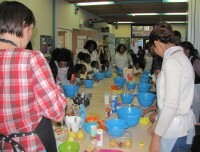 We zested lemons, melted butter and lined up ten sets of mixing bowls, spoons, and measuring cups in anticipation. 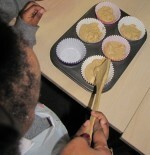 We were then joined by ten local mums who had signed up to learn how to bake muffins with us and their children. And as the end of school approached, said children joined us too, and that’s when the fun began! Clad in plastic pinnies and with name badges on, the kids set about measuring out flour, bicarbonate of soda, baking powder, salt … then yoghurt, sugar, egg, melted butter … and the all important blueberries, or pear and lemon, or raisins. There was so much concentration in the air that we’d like to say you could hear a pin drop, but the reality was that you probably wouldn’t have heard a grand piano drop! Yes, it was noisy, but the children and their mums were having fun and each family managed to produce a tray of six muffin cases filled with their own unique muffin mix in no time at all. We were up against it slightly on the cooking front. We had an oven the size of a microwave to cook 60 muffins in before the kids’ attention spans waned, but we pretty much did it and every family got to take home their buns (if they made it as far as their front doors without being consumed, that is!). 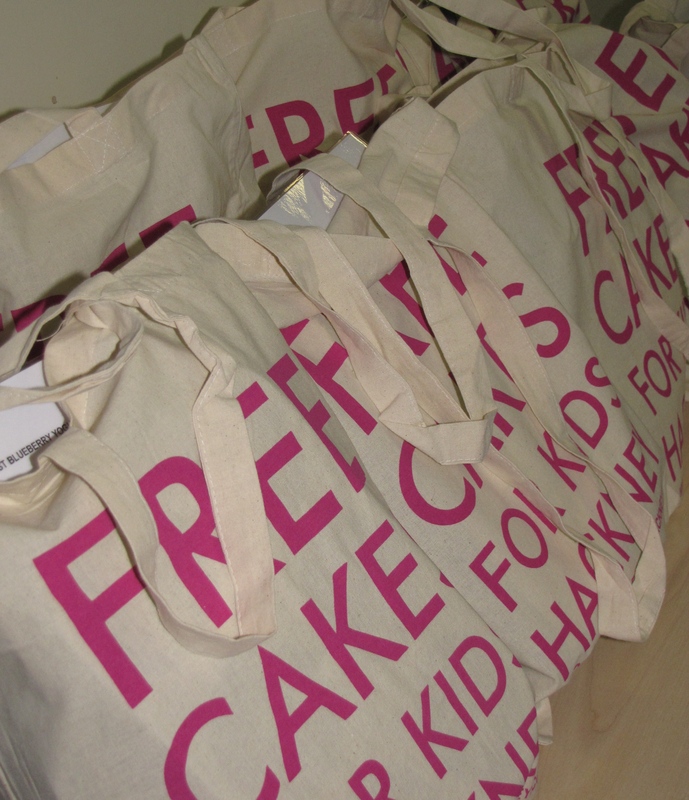 And not only that, they also received a small goody bag from us including a copy of the recipe and all the equipment they needed to recreate the muffins at home, all packaged up in one of our FCFK Hackney tote bags (so expect to see a flurry of them about town!). It was a crazy whirlwind of an afternoon but it was great fun. There are things we have learnt, of course, but we would definitely do it again, and we could quite get used to being called “Miss”! And, most importantly of all, Marie reported back that around half of the families who came told her they tried the muffins at home with their children that very weekend. We are over the moon that the workshop had the desired effect. Cooking with kids is messy and hard work, but so rewarding. We think we’ll skip cooking with animals though! Oh, and did we mention that a photographer from the Guardian came along? No?! Ah ha! Keep checking in and all will be revealed…! Here he is in action – a photo of a photographer taking a photo.